Gentle cleansing of the buttocks, folds of the skin, face, eyes and hands of babies and children.Soaked in a micellar solution based on ultra-mild cleansing agents, ABCDerm H2O dermatological wipes respect the cutaneous balance of the most fragile skin types and provide an emollient effect without leaving a greasy film.create a pleasant sensation of freshness. 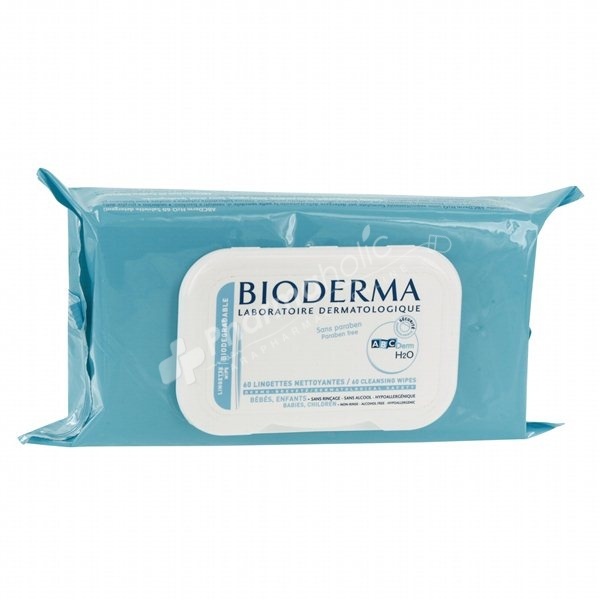 Bioderma ABCDerm H2O Dermatological Wipes perfectly clean baby's fragile and even irritated skin: buttocks, skin golds, face, eyes, hands. They eliminate the stains instantly, without risk of irritation, and get a soothing and emollient effect. The patented natural complex D.A.F (Derlatological Advanced Formulation) increase the skin's tolerance rate. Does not leave any greasy film. Very good cuteneous and ocular tolerance. Does not sting the eyes, biodegradable. Alcohol-free - Paraben free - Hypoallergenic. Wipe clean baby's skin with care. Repeat the application until the wipe is clean. Aqua, Polysorbate 20, Pentylene Glycol, Allantoin, Disodium EDTA, Polyaminopropyl Biguanide, Sodium Hydroxide, Parfum (Fragrance).